As regular readers will be aware I have an ongoing fascination with BBQ. I have already got a Pro Q Frontier smoker and have spent many happy hours utilising it and eating the results. Whilst in theory this can be used as a conventional BBQ grill, in reality, it is not suitable for serious grilling. I therefore decided I would use it as a dedicated smoker and invest in a big bad arse BBQ grill (my current kettle BBQ being on its last legs). 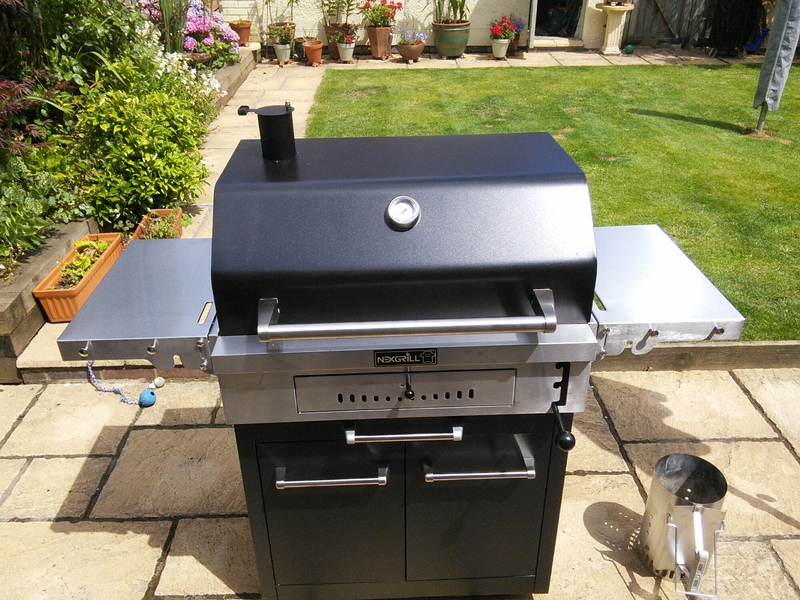 With birthday money to dispose of (21 and a bit – well a lot- being a special birthday ), I spent a number of hours trawling the internet comparing different BBQs before making my choice. I would say I never contemplated getting a gas BBQ as to me you may as well just put stuff in the oven/under the grill and then take it outside to eat if it is a nice day. If you live in a country where you can live outside for a good amount of the year then I can sort of see the benefits of a gas BBQ ( well not really – as has to be cooking with coals for me to be BBQ). Residing as I do in Wales, a particularly rain drenched part of the UK, outdoor living is in no way a desirable option (unless you have webbed feet). On this basis I simply cannot understand the proliferation of gas BBQs in the UK. If lighting charcoal/briquettes is too much hassle (really!) just use the oven\grill or hob and take the results outside to eat! Maybe I am missing something, but I just don’t get gas BBQs. So charcoal it was and after much indecision as to whether to get the Weber One Touch (highly rated) I saw in my local Costco a Nexgrill charcoal grill. This pressed all the right buttons for me in terms of cooking surface size (big) and storage space (lots) and so the decision was made for better or worse. 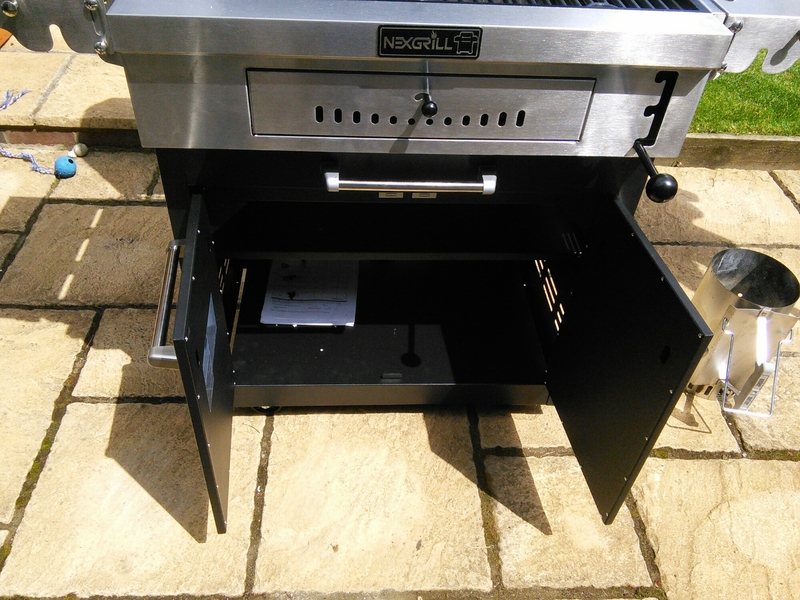 I worked on the principle that I was unlikely to ever have to cater for numbers that the Nexgrill couldn’t handle, with its 820 + square inches of cooking place (according to the box it came in, which oddly was different from the 775 sq inch claimed on the Costco website). On the Costco website it states that it requires minimal assembly time of no more than 30 minutes. Ha, they have clearly no idea who they are dealing with, as I take DIY incompetence to a whole new level and was confident that it would take me many hours if not days and much swearing to put it together. When I attempt anything practical (a very rare occurrence indeed) Mrs. SF wisely departs to a safe distance and waits for me to explode. 30 mins build time - I think not !! To say build time is mininal (at 30 minutes) is in my view taking the proverbial. 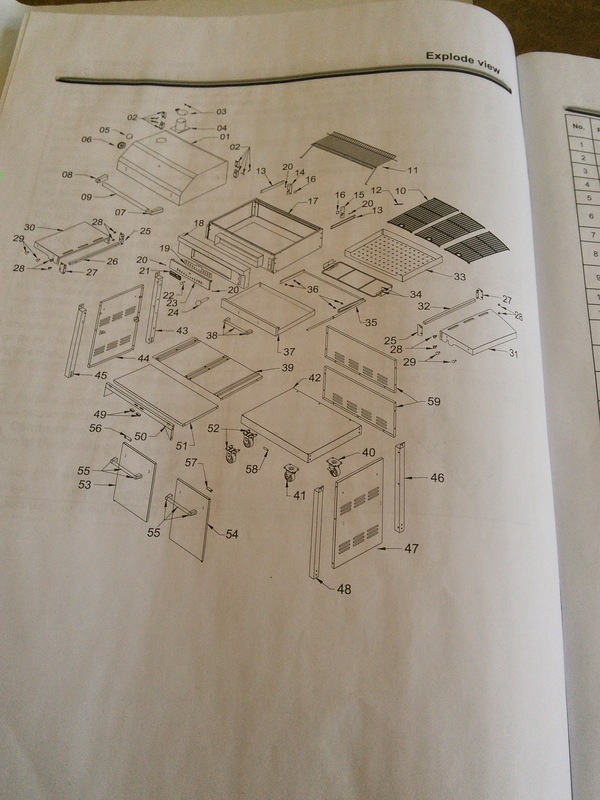 On perusing the manual, with its 24 (yes 24) diagrams of assembly instructions and about a hundred parts, I cried a little and then promptly decided the grief of even trying to construct it (and inevitably cocking it up) was not worth it. I, therefore, did what anyone sane DIY incompetent would do. Yes with no hint of shame, I rang a handy man. Many people my treat this admission with the distain it undoubtedly deserves, but life is too short (although certainly not as short as my temper when building things or rather vainly attempting to) and I’d rather pay someone to do stuff like this than have my blood pressure go through the roof and still have done a dogs dinner of a job at the end. Enter Kev the Handyman, who put it together (amongst other jobs) and saved me much angst. So on the construction front it is not by any means minimal especially if you are like me and have no practical skills whatsoever. It even took Kev, a seasoned handyman, just over an hour and a half to do it. On this basis it would have taken me forever. I would say, therefore, that the mininal (30 minutes) construction time referred to on the box is at best a woefully optimistic and at worst a somewhat disingenuous statement. Well it certainly is a sturdy beast, coming in at a whooping 56kg. In terms of build quality, the control panel, handles and side shelves are stainless steel (the reason for this being these areas get the most contact I assume), with the rest of it steel covered in a black powder coating. 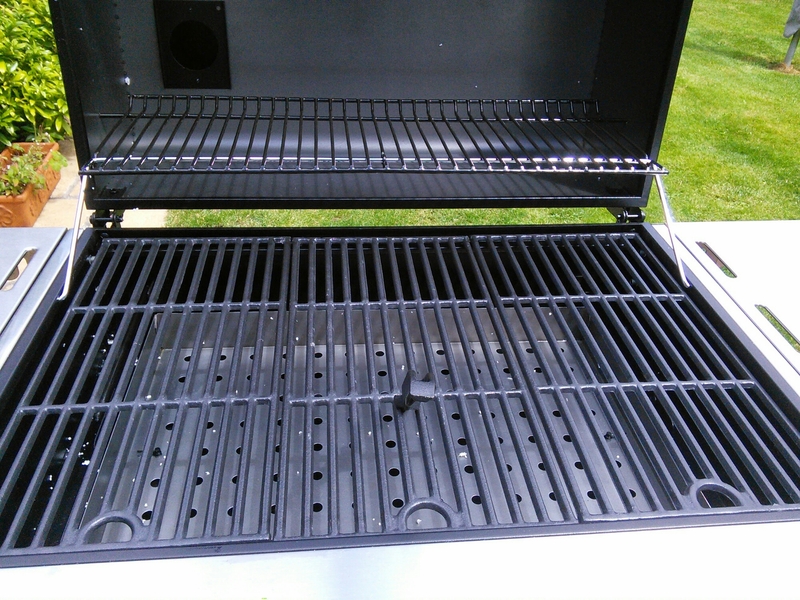 The bottom storage element seems a bit more flimsy that the top business end of the grill but seems sturdy enough and there is certainly plenty of space down there for BBQ tools etc. The whole thing has a built to last look and feel to it. All in all it looks good quality (certainly for the less than £250 price) although it isn’t much of a looker being very blocky. Reminds me of a robot in a cheap " Z" list 50s sci fi movie. 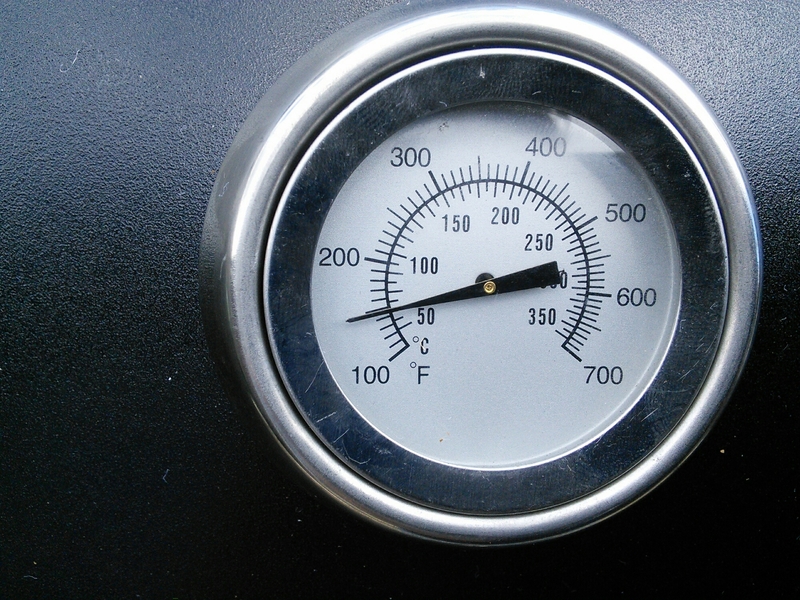 As well as the usual (temperature gauge etc,), the Nextgrill has a couple of nice additional features. The ability to adjust the hight of the charcoal tray with three different settings is great and really allows for the heat to be modulated . The fact that this can be moved up and down with the easy shifting of a handle (like a gear stick) at the front is great. 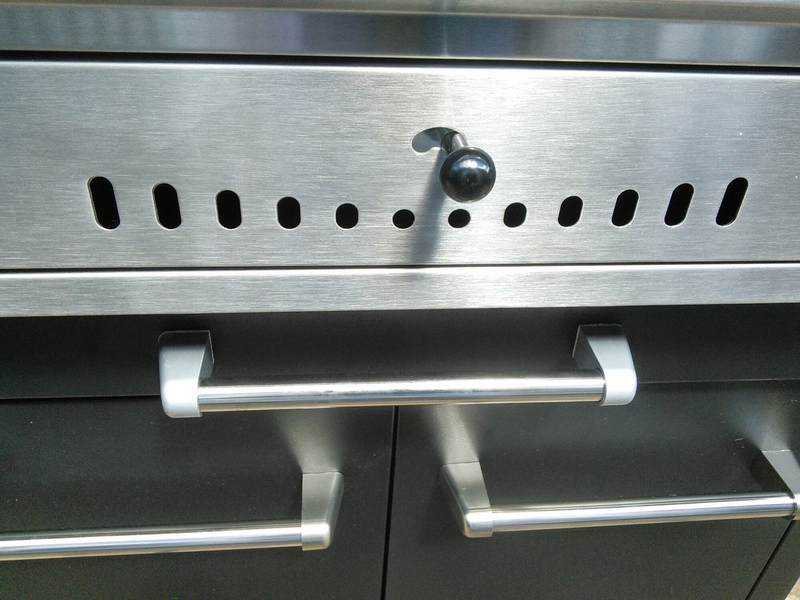 I also like the ease of use of the air vents and the fact that the shelves at the side (handy for putting food ready to go on grill and of course a beer or three for the cook) can be easily collapsed when grill in not in use (makes it easier to put the cover on). In addition to the porcelain coated iron grate cooking surface there is a useful bit of racking off the direct heat which is integrated into the lid/ This will be handy for any indirect cooking or to keep stuff hot but off the direct heat. A further nifty feature is the thingeemajig that allows for easy lifting of the cast iron grates and makes refueling much easier (on many kettle BBQ this can be a pain and certainly is with my Pro Q_smoker). A simple, but effective tool. I also like the easy pull out tray for ash removal, although it does feel a bit flimsey. Included in the price was a sturdy cover which adds to the good value this product represents at just under £250. First impression were me likey, me likey a lot, although I suspect if I had tried to build it myself I would hate it with a passion. So to the important bit, is it any good at cooking stuff? At the end of the day every other aspect is irrelevant if it doesn’t cut the mustard on this front. 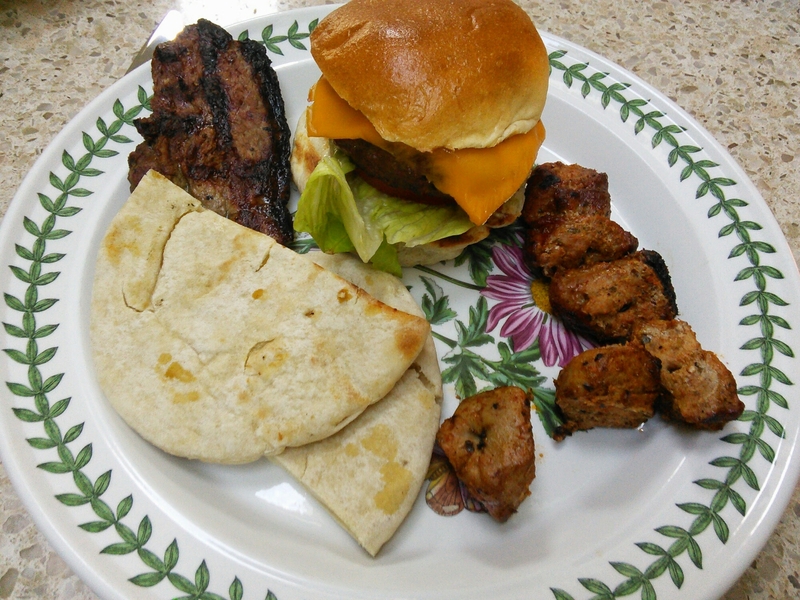 I cooked for my test run some pinchos murano ( marinated pork kebabs using a recipe from Cardiff blogger – The Plate Licked Clean – highly recommended recipe, they were very good), a couple of burgers and some lamb steaks. I was very happy with the end result. Bar from the fact that for a DIY incompetent like me it is nigh on impossible to build this, it is a good bit of kit and great for catering for a fair few people. For the price of just under £250 I thought it was a bargain for what you get. 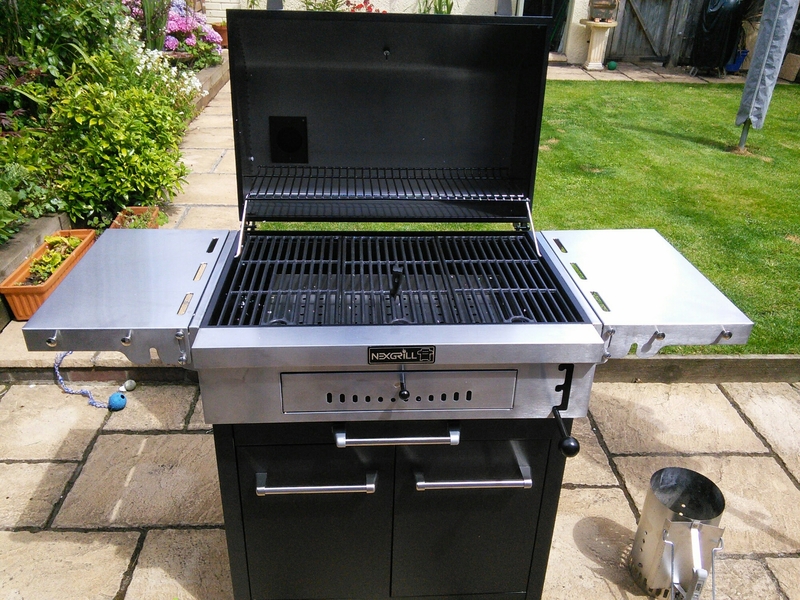 It seems Costco UK no longer stock this BBQ and the only place I can now find it on sale in the UK is Amazon, but for the very expensive (in my view) price of £659.98. I think that is way to much bearing in mind I paid only £250 and it was offered as cheap as £199 by Costco at one point. It is perhaps worth keeping an eye out on ebay to see if any come up for sale. If you desire to take a great deal from this piece of writing then you have to apply such methods to your won weblog. appears like some of the written text on your posts are running off the screen. Checked on various PCs and apple macs as well as tablets and with other readers . So far no one has encountered problem you have experienced. What browser are you using? This has made me chuckle. I stumbled across your blog whilst searching for some additional BBQ kit. I purchased a ProQ smoker a few years ago and have had numerous incredible meals from it. 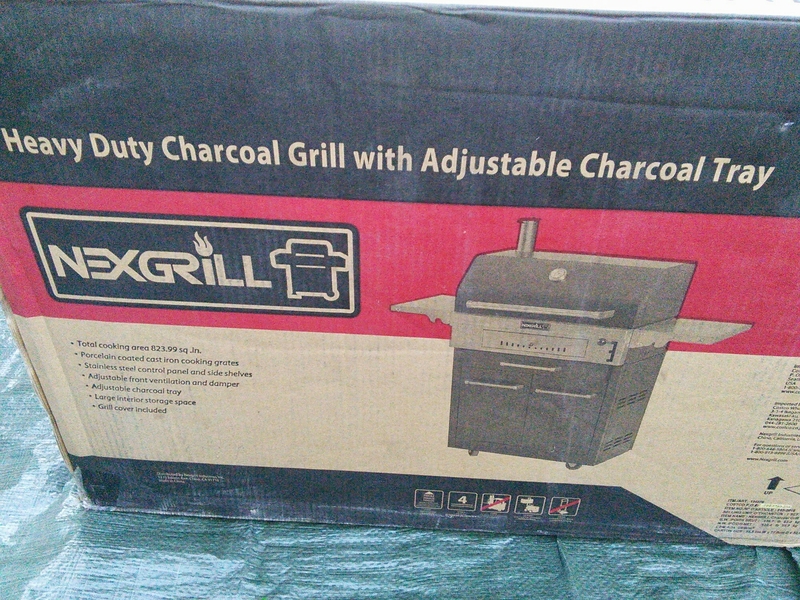 I also purchased the Nexgrill charcoal BBQ from Costco last year – mainly because it was the largest charcoal grill I could find! Great minds clearly think alike! 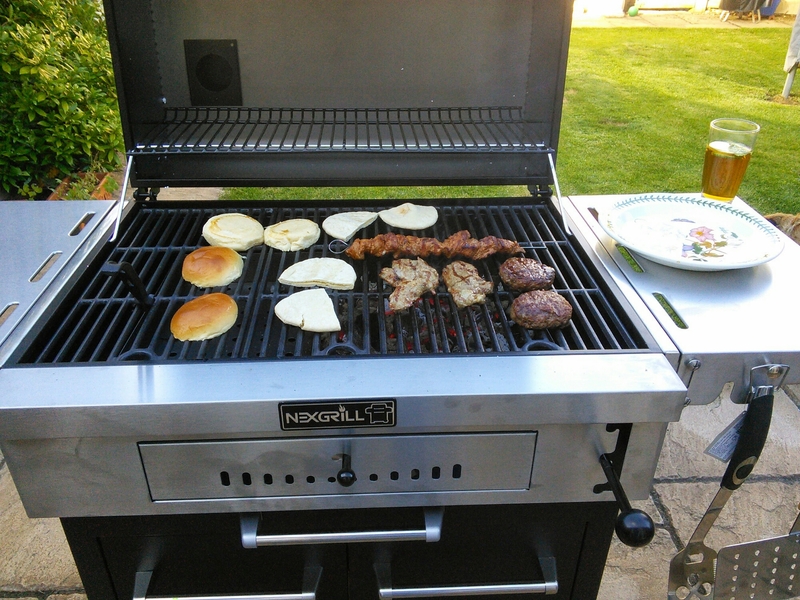 Overall I’ve been very pleased with the Nexgrill. As you have identified, there are a few sections of it which are a bit flimsy. Given the price of it though, I don’t have too many complaints (especially as the alternative I was looking at – the Napoleon charcoal grill – was A LOT more). One suggestion I would make, is that if at all possible store it in a dry shed or garage at the end of the BBQ season until next year. The cover provided is pretty substantial, but I discovered when I “unveiled” mine this summer, that moisture had got underneath the cover and because of the lack of airflow the black lid is now pretty tarnished. It’s still 100% functional, but it has marred its appearance a bit. I’d also agree about the highly optimistic construction time in the instruction manual. I think it took me about 4 hours to put it together, although I did have my 3 year old son “helping” by crawling on my back…. Just in case you’re interested, I was searching for a rotisserie kit to attach to the Nexgrill. There are a few on the market, but I’m not particularly optimistic that the Nexgrill will be suitable for them to attach to. Thanks – good tip re storage. I have noticed moisture gets under the cover 😦 Shame re rotisserie as i think it would be a great edition to the grill . Great additional comments. 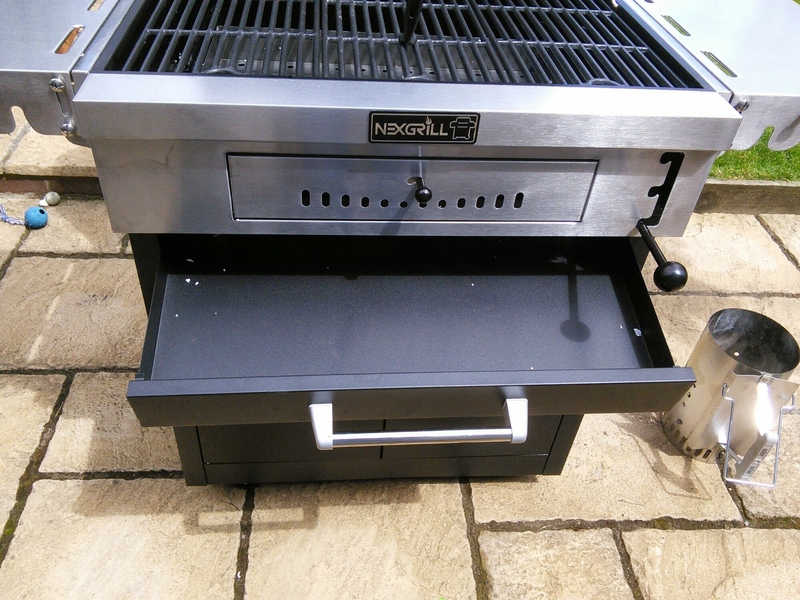 I am looking to get one of the Nexgrills and have also been looking for rotisserie options. If you find one please let me know. Just as a belated follow-up, I contacted Nexgrill and unfortunately they confirmed that there were no rotisserie kit options for the grill as it was not designed for this function. I suspect that we could make one of the universal rotisserie kits for sale work, but in all likelihood it would involve a degree of modifications i.e. holes being drilled into the body of the grill at the very least. to try and do so! Your writing style has been amazed me. Great review and enjoyed your (smelting) humour… Will be purchasing on the back of this. One question, what is the stainless steel item on the floor, to the right of the bbq, used for the coals please? to be updated on a regular basis. It carries pleasant material. Thanks for such a great article. 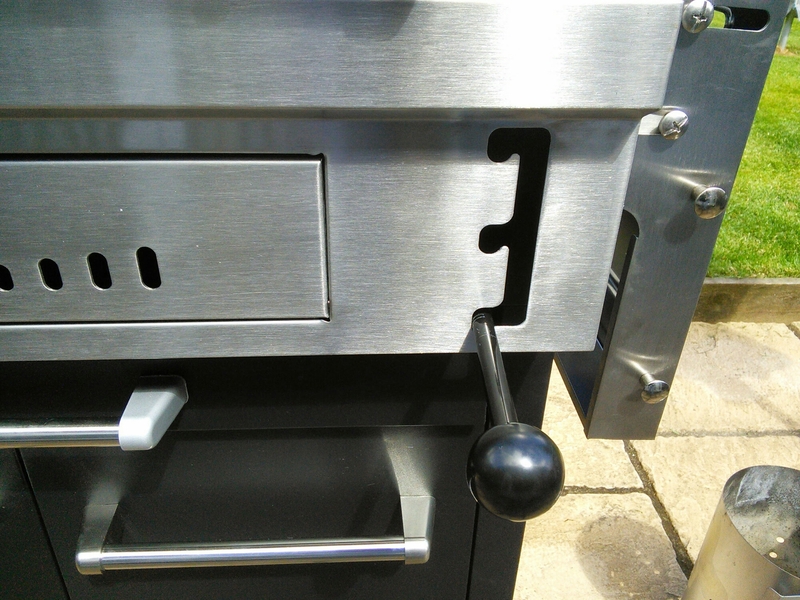 Very amusing and informative 🙂 I found it because I received an email from Costco which had this BBQ featured as a hot buy at £199. So I googled for reviews and came across this page. For the same amount I very recently bought a 4 burner gas BBQ from Homebase and it’s rubbish! It won’t stay properly lit – I’m pretty sure you shouldn’t be able to put your hand on some areas of the cooking area when it’s been on for 20 minutes! Anyway I have just ordered this great looking charcoal BBQ thanks to your recommendation and will today be returning the gas BBQ. Time for me to finally leave gas Barbecuing behind! Thanks and jealous of good deal you have got for it – much cheaper than what it cost me 🙂 Happy grilling. I know mine has been under wraps for couple of week now ; ( very frustrating. One thing, what do you do with the chimney flap? It is tightly closed but you can spring it open. When are you supposed to do that? Presumably when cooking with the lid closed. I can’t see any mention of that part’s operation in the manual? I assume is a pressure value – but not sure to be honest. How long did it take you to build it ? It definitely can’t be built in 30 minutes however! Yes! Finally someone writes about vintage kitchen scale. This entry was posted on Jul 13, 2014 by solicitingflavours in Barbecue, Burger, Cardiff, Charcoal BBQ, Costco, Food, Food and wine products, home cooking, Nexgrill, Wales.